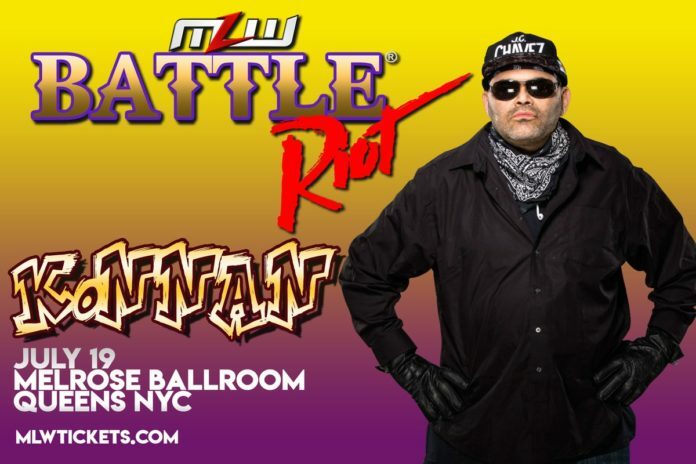 Konnan is coming out of retirement to wrestle in a match under the MLW banner. The promotion officially announced during a recent episode of their MLW Radio podcast that former WCW United States Champion will be coming out of retirement to compete in a match at the Battle Riot/Fusion TV taping that goes down in New York City on July 19th. The Battle Riot match is a mash-up of a battle royal, royal rumble and anything goes street fight that will feature 40 wrestlers with new participants entering the ring every 60 seconds. The way that this match will work is when an elimination can come by pinfall, submission or by throwing an individual over the top rope. The winner of this match is slated to get a World Heavyweight Title Shot in the future. Several wrestlers have already been announced for the match including John Morrison, Kevin Sullivan, ACH, Davey Boy Smith Jr., Teddy Hart, Rich Swann, Pentagon Jr., Jimmy Yuta, Jake Hager, Swoggle, Lance Anoa’i, and “PCO” Pierre Carl Ouellet. Konnan appeared to work his final match back in 2013 when he took part in a six-man tag match that saw him team up with El Mariachi and Kafu to beat Derek Sanders, Oliver John and Vaquero Fantasma. The promotion will be announcing more participants for the match in coming weeks. Tickets for this event start at just $20 and you can buy them at this link. What are your thoughts on Konnan coming out of retirement to work the match?